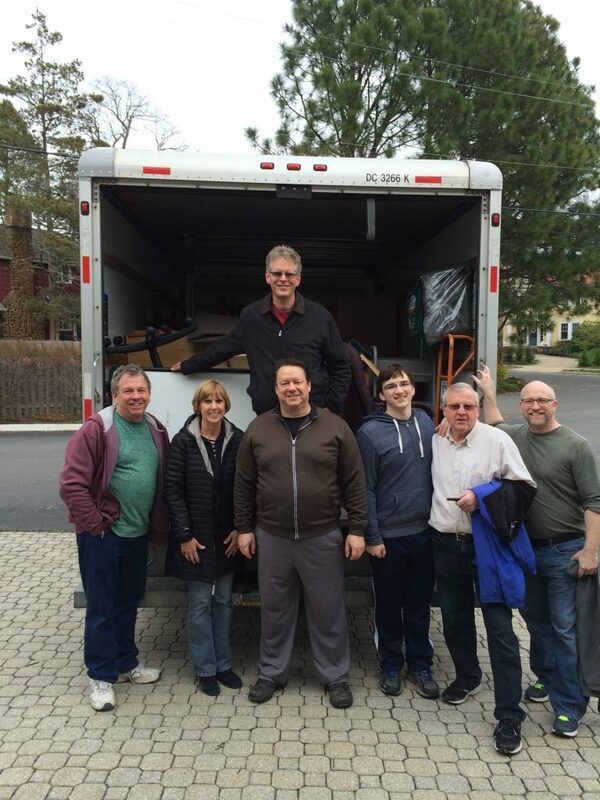 Fred Farwell, Karen Kaasmann, Matt McLiverty, Nicholas Donahue, Walter McGrail, Chris Donahue and Gary Smith help unload furniture at Atlantic Highlands UMC. Being good stewards of the church can take on many forms. When the staff at the Greater New Jersey conference office was planning their move to the Mission and Resource Center, they knew there would be functional and valuable furnishings and supplies that would not be moving with them. Announcements were placed in The Relay and Digest and Lida DeNardo, Executive Assistant in Finance and Administration took charge of setting up tours and keeping inventory of what was available. Dozens of church leaders took advantage of the free furniture including Montgomery UMC, Hamilton UMC, First UMC Westfield, Good Shephard UMC, Church of the Master in Howell, Park UMC in Bloomfield, St. Paul’s in Ocean Grove, Atlantic Highlands UMC, and C.A.M.P. YDP in Paterson. “We have also renovated the offices creating clean, organized work spaces and a beautiful new break room for our employees,” added Ferrgino. Atlantic Highlands was able to put in new kitchen cabinets for their food pantry and upgrade the office furniture for the administrative assistant. “We’ve transformed our library into a small meeting room by obtaining nice conference chairs,” said Kaasmann.